If you take your time and be methodical, there is no reason why you cannot trace and repair ignition faults. It does help if you have parts to fit as replacements where you suspect a certain part may be at fault. Tools needed apart from the general screwdrivers, sockets and spanners will be a flywheel holding and removal tool and test light set up. In this the ignition section, I am going to run through finding faults in your system, primarily no spark. I shall also latter on try and explain how to set and adjust your timing! 80% of all ignition faults are caused by either spark plug, plug cap or the H.T. lead. So you first job is to take the plug out of the cylinder head, re fit it onto the cap. Place the spark plug onto the engine casing at some point. Now (with the ignition on of course) kick the engine over, and check for a spark. If you do have a good strong spark at this point, no need to go any further, your problem lies else where! The spark at the plug should be visible between the electrodes, if it "tracks off" elsewhere onto the plug or engine, replace the plug and try again. Now presuming you are still with us because you have no spark, the next job is around the other side of the machine. Your junction box, or rectifier where all the wires meet is your next step. Find the green that comes from the magneto, or flywheel, unplug it again hold it onto the engine and kick over. This may sound hard, but while kicking over, lean over the machine to hold the wire onto the engine, or get some help! OK if you have a spark here your problem lies either with the cap, plug lead or H.T. coil. The only true way to establish which one the problem is occurring with, is to replace the items one by one. You can eliminate the plug and cap, by simply unscrewing the plug cap from the lead. It will in most cases twist off as there is a self tapping like screw within the cap which allows the cap to screw onto the lead. Again with the cap unscrewed, place the end of the lead as near onto the engine as you can and kick over. If you now have a spark, replace the cap and for the cost of it the plug as well. If you still have no spark when you have tried the lead, the problem will be the lead or coil, least expensive is to start with the lead, and repeat the process again. Still no luck the problem will be the coil, but just before you rush out and purchase a new coil, is the earth wire between the coil - frame- and mag housing in place and making good contact? OK back to you have no spark at the green of the mag housing, this leaves the stator plate itself, presuming you trace the wires back into the mag housing and they look undamaged. 98% of faults with the stator plate will be the points and condenser. Check that the points are opening at the firing point. There should be a arrow mark on the flywheel, line this up with a notch on the mag housing at around 12 o clock position, you may need to clean the mag to be able to see it. Just as a footnote some 4 pole models do not have these markings, just check to see if the points are opening. Some Spanish models may have two marks, the one to the right will be TDC, the one to the left will be the firing point, this is when the points begin to open. When the arrow and the notch line up, this is called the firing point, the contact breaker points should now begin to open. If the points do not begin to open at this point they will need to be adjusted. So you will need a test light or you can quite easily make one yourself! 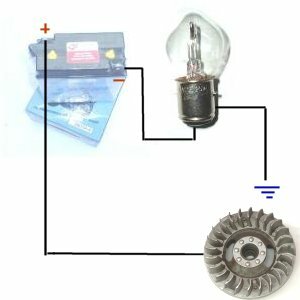 This is easy, all that is needed is a bulb socket with two connections, power and earth (a car one is fine) and a 6V bulb. Two wire will need to come from the bulb/socket, one goes to power one to earth. Next is just a length of wire to be able to complete the circuit. If you Lambretta is a non battery model, you will need a battery to power your equipment! Going back to the bulb socket I actually use an old headlight main socket that had a couple of bad contacts elsewhere, all you need to do is get the bulb to light up by providing power and and earth, and you have your test light. Below, is a very quick diagram on how to rig up your test system for checking the timing. Now the light on the bulb should be on to start with if you have correct connections. What we are looking for is the bulb to go brighter when the points start to open. The point at which this should happen (the firing point) is 23 degrees on Li SX TV models, and 21 degrees on GP models, a dial gauge is the only way to measure accurately this point if it is not already marked. If you need to find the firing point because it is not marked, or you think it may be incorrect (say in and engine rebuild situation) first off you need to find TDC. This is when the piston is at its furthest point of upwards travel. i.e. it will not go higher, and just before it starts to come back down again! The most accurate way to find this is by use of a dial gauge with the cylinder head off, some gauges will allow you to find it through the plug hole, but many of the one's available may not allow you to get the tool far enough inside to be able to use it. When you are happy you have found TDC, I tend to make a mark on the mag housing which meets with the arrow on the flywheel. If you do this (making sure you are happy that you are at TDC) it merely saves you time finding it again should your adjustments go wrong and you need to re check things! Now you need a dial gauge, which are quite cheap and available from just about all motorcycle and scooter shops. The dial gauge simply is a round instrument with degree points marked around it. So you line up zero degrees with your TDC mark, and then go anti clock wise around the gauge and find your timing point, remember 23 degrees Li SX TV and 21 GP! Now make the second mark on the mag housing, you now have your firing point. The whole point to this is coming now! The second notch in your mag housing you have just made, is the point that when the arrow on your flywheel reaches it, the points should start to open, you test light system / set-up, will get brighter. It should get bright exactly on the point the arrow and timing mark line up, too early of after they have passed we need to adjust them. Now where was I, oh yes - lets say your bulb does not get brighter at the firing point, presuming you have all your measurements correct, i.e. TDC and firing point, the next step is to adjust your points. First before we do this, you will need to check that your points are in good condition, clean and the two contacts meet "square on" together. If they are not either replace or with a small piece of sandpaper, file the two surfaces until they are flat and clean. If you need to replace you will need to tell your dealer the make of flywheel and type of points as well as an puller and holding tool), when you have the flywheel off, simply undo the centre screw of the contact points and they will begin to become free. You will need a soldiering iron, to undo the wire, and to re solder it back on. Simply fit the points in the reverse way that you take them off. Then only real point is that the wire you solder on, should not stick up as there is very little room when you put the flywheel back on, and this wire may rub against the flywheel causing it to catch and rub away the outer casing. At least miss-fire will occur at worst you will loose all spark. Now you have your points renovated or renewed, time to set them up. Again using the method to check the operation at firing point, you will need to mess around quite a bit now unless you are lucky and get it right first time. Adjustment is made by undoing the centre screw, moving the points on a axis slightly and then nip the screw back up and re-check. I cannot tell you which way you should turn the points as it is trial and error, but I can tell you that you will need to make only very small adjustments in this way, to affect the firing point in a big way. Move it very slightly and keep re-checking is the best way. Now if you are defiantly sure you cannot achieve your correct timing point after completely adjusting to both directions the points can turn, you will need to twist the stator plate around very slightly. This is done by undoing the three retaining nuts, and slightly moving the stator plate around. re-tighten this and start the process again of adjusting your points. Still no luck, turn the stator the other way! Electronic system, just a quick note, but these very rarely go out of adjustment to firing point once set correctly. The way to check them is, there will be two marks on a window of the flywheel. Next look for the little black box on the stator plate, again this has two (nearly always white) lines on it. When the window passes over the black box you are looking for the marks to line up with each other. Adjustment is made by undoing and moving around the stator plate, but as I said this rarely needs doing! Back to I still have no spark next up is to change your condenser. Buy the correct one for your machine again as like the contact points, state the make of magneto when ordering. condenser is very simple, just undo the one retaining screw, un solder the wire on the top, take out, put in the new one. Re-solder the wire back on and refit the screw Done! Finally if you are sure you have made all the correct replacements and adjustments, and you still have no spark, go over everything one more time, do not pass go and do not collect £200. And still you have no spark, the problem lies with the low tension coil on the stator plate itself. Now you can replace this, but if you are happy to do this yourself then you are happy enough not to need instructions on how to do it. It is far better to have your dealer replace the LT coil or exchange (if they offer this service) the stator for a refurbished one. Just remember that stator plates have not been manufactured for around thirty years now, they are becoming thinner on the ground (usable ones anyway), so if your dealer cannot do this for you, an electronic kit may be the only option, itself a very good idea!